A watershed is an area of land that drains to a common waterbody, such as a stream, river, lake or ocean. Basically, you can describe any place as part of a watershed, because all areas of land drain to someplace. In our case, the Newtown Creek watershed is a highly urbanized area, and includes a vast industrial zone, major highways, cemeteries, parks, as well as several residential neighborhoods. One defining characteristic of the Newtown Creek watershed is the sewer system. We are home to the Newtown Creek Water Pollution Control Plant (WPCP), one of New York City’s largest sewage treatment plants, that serves approximately one million residents within a 15,000-acre drainage area. Sewage is brought from this expanded area, treated and released at the WPCP. In this way, Newtown Creek has an additional area related to the watershed that we call the sewershed. The map below shows the Newtown Creek sewershed that extends into Manhattan and our neighboring Bowery Bay sewershed in Queens, as well as the “natural watershed” area for Newtown Creek in green. When the weather is dry, the plant has capacity to fully treat (to Clean Water Act standards) 310 million gallons per day and during weather, the plant can partially treat up to 700 mgd. When wet weather conditions exceed this capacity, the excess combined sewage and stormwater is released directly to Newtown Creek. This is called Combined Sewer Overflow. CSO damages the Newtown Creek ecosystem, and creates hazardous conditions for people on the water due to the pathogens that come along with untreated sewage. The area that contributes CSO to the creek is the green watershed area above. In order to better understand how and when the sewers overflow, NCA is collaborating with the SWIM Coalition, Queens Public Libraries, Brooklyn Public Libraries, and the “dontflush.me” project to install weather stations throughout the Newtown Creek watershed, with support from NYCEF Newtown Creek Fund (Hudson River Foundation) and Deutsche Bank Americas Foundation. *Some of the above stations are temporarily out of service. 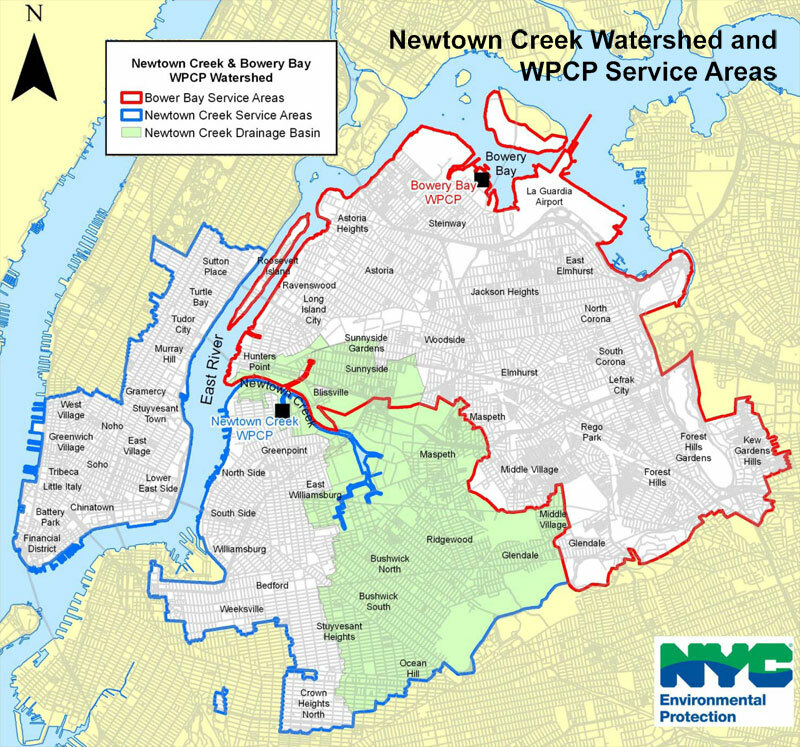 We want to estimate how much stormwater is entering the sewer system and when, and provide watershed residents with information about how wet weather impairs Newtown Creek. We can combine the rainfall data with what we know about the available capacity in the sewer system to create an alert system for sewer overflows. When the watershed is “on alert” we hope that watershed residents will hold off (within reason…) on flushing, since toilets in the watershed will flush directly to the creek when CSOs are occurring. 2. Twitter Alert. Follow us on twitter @newtowncreek. Using the hashtag #CSOalert, tweets are delivered during and after our system is triggered, notifying waterway users of how long it has been since sewage discharge. We also encourage folks to use #CSOalert to tag any photos that document actual CSO activity. 3. Text (SMS) Alert. Users can send a text message to our CSOalert line at 646-576-7448 to see if CSO activity is happening or when the last event was. Text the word ‘status’ for updates; ‘join’ to subscribe for automatic alerts and ‘leave’ to unsubscribe. Additionally, anyone can report a real time CSO event to our SMS system. Text ‘report’ followed by a description of the event, namely where and when you see untreated sewage water entering the creek. The final component of our Weather in the Watershed program is outreach and education. We have partnered with the Brooklyn and Queens public libraries to host a number of workshops to discuss the importance of weather in our urban setting, how our wastewater system works and how people can use information from our weather stations and alert systems to be better connected and have a personal impact on water quality in Newtown Creek and surrounding waterways. If your school or organization is interested in scheduling a class, please get in contact with us – info (at)newtowncreekalliance.org. Click here to see more photos from our Weather in the Watershed classes. A text alert will tell you when you can flush your toilet without poisoning Newtown Creek Gothamist, April 2014. You can get a text alert if your toilet flush will send sewage to Newtown Creek Brokelyn, April 2014. Sign up for these nifty sewage alerts and you’ll never be up sh*t’s creek Bedford + Bowery, April 2014. 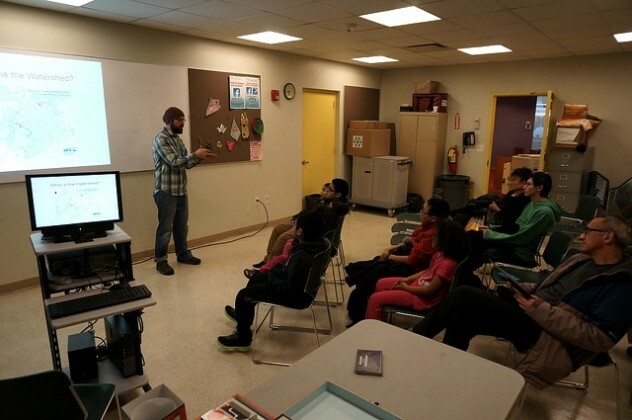 Newtown Creek activists host watershed info seminars Queens Ledger, February 2014.